Many seniors dating grew up without the benefit of modern day technology. For those people who now want to get involved in senior dating, there was no Facebook, Twitter or other instant social media to use - and certainly no computers or smartphones to help. As a result, the older generations were very limited in who and how they could communicate with. Now, of course, many seniors have fully embraced technology, and are adept at working on computers at work or paying bills on-line or communicating with others via email or one of the popular instant messaging Apps on their smartphones. 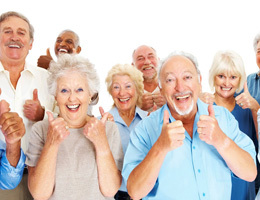 However, there are other seniors for whom communicating via computers is still a little bit of a mystery and who struggle with getting used to modern technology. Still, considering that specialised senior dating sites offer the best opportunity to find a new partner or someone to date for most seniors, it's well worth that extra effort to get acquainted with how to access and use such dating sites. The suggestions and tips below assume that senior daters have the basic knowledge about accessing senior dating sites via the internet. In reality, most sites are relatively straightforward to log-on to and use and, usually, all that's needed is a valid email address, and a username followed by a password - and all this can be completed in less than 5 minutes. The next step for senior daters is to create a free personal profile on the site, whether they are looking for the one or just a friend, and this is also relatively easy. Naturally, it's important to be concise and accurate when writing a profile and then regularly updating information so that other members can know more about the person they are viewing. It's also worth adding some special, but not overly confidential, personal details so that other users can get a complete picture of what other members are looking for. Most sites have two tier memberships, with typically, only certain key features accessible to non-paying users. Senior daters, with a little practice, can learn how to, amongst other things: setup photo albums and include their own photos; search for possible matches based on various parameters; exchange "winks" (or electronic greetings using symbols) and greetings with other users of interest; use and participate in the dating sites forums and blog pages. For those senior daters who choose join sites as a paying member, they can learn all about the additional functions such as: browse a 'first date idea' section, which is helpful in giving some idea of a suitable activity on a first date or chat online via the instant messenger features. Invariable such paid memberships also offer advanced searches with key basic criteria including: gender, age, location; with photos; online now; and refinement and sorting of results by various filters. Registered users of senior dating sites can also stay in contact with those they are in touch with by using both Android and iOS Apps whilst on the move. So, for most senior daters, once they are familiar with the basic of operating a computer they are equally as capable as any younger dater when it comes to getting around a specialised senior dating site!